Born: October 4, 1888, Indian Territory. Died October 11, 1961, Pawhuska, Oklahoma. 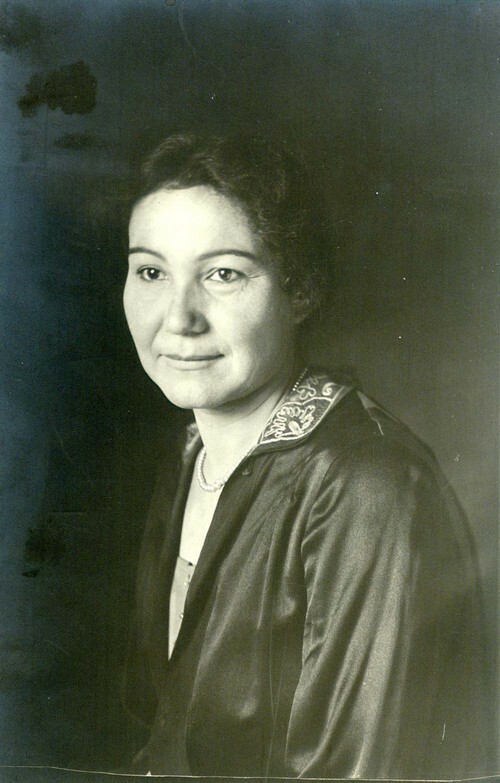 The first woman to serve as principal chief of the Kaw Nation, Lucy Tayiah Eads was born October 4, 1888, in a tipi on the banks of Beaver Creek, Indian Territory, now Oklahoma, to Little Tayiah and Lezitte (Mo Jan Ah Hoe) Bertrand. Named Cha-me “Little Deer,” her father was a Kansa Indian and her mother was Kansa and Potawatomi. Eads was born during a tragic era for the Kansa people. During the early 19th century the Kansas or Kaws occupied much of what would become eastern Kansas. Treaties diminished their lands to 20 square miles near Council Grove, and in 1873 the people were moved to 100,000 acres on the Osage Reservation in present day Kay County, Oklahoma. No dwellings existed to accommodate the 500 Kaw men, women, and children. Amid poverty, sickness, and discontent, Washungah was elected principal chief in 1885. When Eads was only five years old her parents died of starvation. She and her younger brother, Emmett (Ki He Kah Mah She), were left orphans. According to tribal tradition, Chief Washungah adopted and raised the children. He died in 1908 before Emmett was 18. Eads was trained as a nurse at Haskell Institute in Lawrence and she soon moved to New York. In about 1908 she married Herbert Edward Kimber. The couple had three daughters. They divorced and she married John Rhea Eads around 1913. They had six children. In 1924 Eads delivered a petition to the Commission of Indian Affairs in Washington, D.C., to reestablish the Kaw Agency. She was invited to the 1929 presidential inauguration for Herbert Hoover and Charles Curtis, vice president from Kansas, and fellow Kaw. Eads made education a priority for her people. She was reelected principal chief, but the government agency was abolished in 1928. Eads later worked as a nurse at Haskell. The family was living in Pawhuska, Oklahoma, when she died October 11, 1961.